More correctly called, in English, Reckoning Counter. Also Jeton (French) & Rechen-pfenning (German). A coin-like object used in the calculation of accounts. Most commonly made of copper or brass; but also silver (especially 17th century and after: very rarely gold. Lead jettons are also known but their purpose is obscure as they would wear out fast. Jettons are known from England, France, Netherlands, Germany, Austria, Poland, Czechoslovakia, Hungary, Italy, Portugal, Spain & probably other countries. Originally "jettons" would have been pebbles or pieces of pottery (the word calculate derives from Calx - pebble). The first specially struck jettons seem to be mid 13th century (French), the earliest English fourth quarter 13th century. They never show a mark of value because, unlike tokens, jettons merely represent a value, by means of their position on a reckoning table ( or cloth) also known as an abacus. This is not to be confused with the bead frame device still in use; although employing a similar principle. They were in common use before current methods of arithmetic using so-called Arabic numerals were adopted in Europe. Their general use probably ceased in 17th century, although retained for ceremonial reckoning of accounts in France and the Netherlands until the 18th century. Later pieces, looking more medallic, were also used as entry passes and convention souvenirs . Jettons had been widely used as gaming counters from 15th century. English jettons were first produced during the reign of Edward 1st. Many were struck from dies made using the same portrait punches as sterling pennies; implying striking by mint officials. Many varieties, mostly of sterling penny size, are known, always copper or brass, with or without king's effigy. Some pieces can be considerably larger: especially the type with a bust resembling the radiate portrait of the Roman Emperor Postumus (up to 32mm). All English jettons seem to be pierced, either completely or partially. This is the best way of distinguishing between English and French jettons which can be very similar. The last major series of English jettons seems to be late 14th century. A few are known, in silver, for the 15/16th centuries struck for noble households (see Medallic Illustrations of British History). Subsequently they were imported, initially from France, then from Tournai and finally from Nuremberg. Edward III jetton. Design derived from portrait of the Roman Emperor Postumus. Legend reads 'Le Soudan de Babylon'. France: the earliest French jettons are claimed to be from the reign of Louis VIII (1218-1252) ; but this is based on royal coats of arms shown on some early pieces. There is a great variety of types, all copper or brass until mid/late 15th century when silver was also used. Silver jettons are very rare at first, but very common by the end of the 17th century; by which time their original function had virtually ceased. Almost all were struck at the Paris mint; their right to strike jettons being very jealously guarded. Very similar pieces were still being struck late into the 19th century. Italy: there is a large, and very varied, series of jettons issued by representatives of the Italian banking houses that took over (in England) the financial functions of the Jews; after their expulsion by Edward 1st in 1290. It was thought that the early adoption of sophisticated accounting techniques meant they were not used in Italy itself, however, several large Italian municipal collections have recently been published. 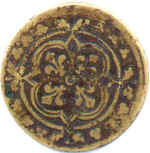 These Italian jettons, probably struck from the very end of the 13th century until the end of the 14th, frequently show monograms or merchants marks; but these are rarely identifiable. Netherlands: There are several different series of jettons that can be classified under this heading. Jettons were struck in Flanders probably from the 14th century. The jettons from Tournai (now in Belgium) are so commonly found in Britain as to lead one to assume that this area was our prime source of supply in the late 15th and early 16th centuries. The very numerous series of rather medallic looking jettons, most familiar from their depiction of events in the wars between Spain and the United Provinces during the 16th and 17th centuries, started with issues from the Duchy of Burgundy. The cities producing this quite homogeneous series extend from Groningen in the north of the modern Netherlands, through Brussels in modern Belgium, to Lille, now in France: so large were the territories under dispute. Germany: Although it might seem that Nuremberg was the only German city to strike jettons, this is far from the case. Although they are not commonly seen in Britain, jettons may be found from Prussia, Saxony, Bohemia etc. and there is an extensive series from Hanover. These were issued by the mint-masters in Clausthal and Zellerfeld, and those struck during the 18th century have the same names or initials as appear on the Anglo- Hanoverian coins. Nuremberg: This city was the prime source of the jettons used in Britain from the middle of the 16th century. The earliest seems to be a very extensive series of mostly small (approx. 20mm) brass counters with an amazing variety of types, including bishop, horse, monkey, shields, and also the reichapfel or orb which is almost a Nuremberg trade mark. These early pieces have been found on pre-reformation sites and probably date from the first quarter of the 16th century. From about the middle of the 16th century it became common for the maker's name to appear, and a list of some of the more commonly seen names is given later. Some of the types of counters from Nuremberg are extraordinarily common, particularly the type with the orb on one side and a circle of crowns and lis on the other. These were issued from 1550 to 1630 approx. and turn up in almost every excavation anywhere in the country. Other types commonly seen depict a ship, the lion of Venice, or a merchant reckoning with counters. In addition to these general types there are a great many rather medallic counters mostly issued by Hans Krauwinkel or Wolf Laufer, sometimes in sets. The Nuremberg counters continued to be struck for use as card counters after their use for reckoning of accounts ceased; and to this class must be added the series of brass counters depicting the portraits of reigning British Monarchs. These run without a break from Charles II to George III; the fact that they are of contemporary manufacture can be deduced from the maker's name which invariably appears. Their issue continued until the First World War when Lauer, the principal manufacturer went over to the production of emergency tokens or notmunzen. The abacus, on which the jettons were placed, could vary considerably. It could be a special cloth embroidered with squares or lines, a wooden board rather similar to a shove ha'penny board or just lines marked on a table. It could also vary in size, depending on how many people needed to see the accounts being reckoned: the English Exchequer table being 10' x 5'. Although there were many ways of laying out the counters, a simple method is illustrated. The method of subtraction is very similar. This time we work down from the highest numbers removing jettons as each line is completed. To subtract 70 from 40 take one jetton from the 100 line and add three to the 10 line. Finally to subtract 4 from the smaller number take one from the 10 line and add 6 to the units. On tidying the board to avoid having too many jettons on a line we finish up with the result on the right. Multiplication could be done either by multiple addition, or by the use of multiplication tables. Division was also possible using jettons, but was even more complicated. This list only contains the most frequently seen names. Full details can be found in "Die Nurnberger Rechenpfennig-schlager" by C.F.Gebert, the source of the dates given above.